The Leafbirds are a small group of arboreal passerines found throughout tropical Asia. All are in the same genus Chloropsis so they are all closely related. Five species are fairly widespread in SE Asia/Greater Sundas; one is endemic to Sumatra, and two are endemic to the Philippines. Leafbirds tend to be various combinations of green, yellow, and sometimes a little blue, but perhaps the most attractive is the Gold-fronted Leafbird (left or above) which can sometimes be found feeding on flowers. We had several working the bottlebrush at the Quality Inn along the Kosi River in the w. Himalayan foothills. Leafbirds have spiked tongues adapted for taking nectar (like the Rhabdornis of the Philippines) and often poke into tubular flowers but, unlike Rhabdornis, they build cup-shaped nests. For this reason, their arboreal habits, and their whistled songs, they sort-of remind me of North American vireos. 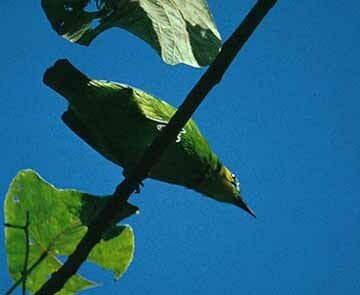 I've had the good fortune to see all three of the island endemic leafbirds. One of them is the Yellow-throated Leafbird (right), found only on Palawan I. and adjacent Balabac and Calamian islands. Leafbirds were traditionally considered closely related to the Ioras (Aegithinidae). Like ioras they tend to forage alone or in pair in the subcanopy, often eating berries and fruit and well as insect prey. Even some recent literature place the leafbirds together with the ioras in the same family (e.g., Kennedy et al. 2000). But DNA studies (Sibley & Ahlquist 1990) showed that leafbirds were not that closely related to ioras but were more closely related to bushshrikes, helmetshrikes and vangas within a broad corvine assemblage that arose in Australasia. They have fairly hefty bills for their size (recalling a miniature cuckoo-shrike) but are short-tailed. Once also considered related to the bulbuls (Pycnonotidae) but having some characters of drongos (Dicruridae) or cuckoo-shrikes (Campepahagidae; Austin & Singer 1961), Sibley & Monroe (1990) placed then next to cuckoo-shrikes in their own family. Leafbirds are clearly closely related to the two species of Fairy-Bluebird (genus Irena) which some place in the family Irenidae (which name takes precedence over Chloropseidae). Many recent books on Asian birds lump them together in the same family. Taxonomic relationships of these Asian families remain uncertain and controversial. The Handbook of the Birds of the World project apparently will separate the Leafbirds as a family and split off the Fairy-Bluebirds as another. This family-splitting seems odd when they haven't split up the barbets (into three) which proposal is supported by substantial biochemical evidence and other analysis. But they've adopted a more traditional approach and so I've just followed suit. Photo: The Gold-fronted Leafbird Chloropsis aurifrons (top) was at the Quality Inn near Ramnagar, Uttar Pradesh, India, on 13 Mar 2001. The Yellow-throated Leafbird Chloropsis palawanensis (top) was photographed at Balsahan, Palawan, Philippines, on 21 Feb 1990. Photos © 2001 D. Roberson, all rights reserved. There is no family book as yet nor much written about this group at all. Austin, O. L., and A. Singer. 1961. Birds of the World. Edited by H. S. Zim. Golden Press, New York. Kennedy, R. S., P. C. Gonzales, E. C. Dickinson, H. C. Miranda, Jr., and T. H. Fisher. 2000. A Guide to the Birds of the Philippines. Oxford Univ. Press, Oxford, U.K.